PC Building Simulator comes out of early access, is it still worth playing? Best answer: PC Building Simulator was an excellent game that allowed you to build your dream PC. Now, out of early access, it's even better and worth playing, even for veteran system builders. The prospect of starting your first PC build can sound daunting. What if something goes wrong and you have an incompatible part? How do you know if it'll all work together? These types of questions will always be at the front of your mind, which is why PC Building Simulator is a neat tool to rely on, so you can build a visual representation of a PC you'd like to put together. As covered in my detailed review of the PC game, it's an invaluable tool for putting together a PC. You can make a basic barebones PC with standard cooling and parts, or you can go all out with a custom water loop. And yes, there's plenty of RGB lighting. A step-by-step guide — much like our own PC building guide — is also available to run you through the various steps to take. Building a PC has never been easier. 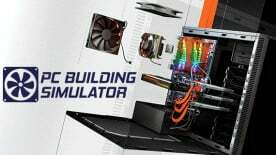 With the release of version 1.0, PC Building Simulator is a more fleshed out game both in terms of content and supported vendors, but also in the main campaign. Here, you take charge of a small PC repair shop, which sees customers drop off PCs that need checking. The game has support from AMD, Intel, MSI, NZXT, Razer, EKWB, ZOTAC and more. You'll find real products that require similar compatibility checks you'd perform when building a PC in the real world, allowing you to play the game like a test run and as a way to get to know parts and common issues. Whether you're just starting out with your first PC build or simply wish to run your own virtual PC repair shop, PC Building Simulator is worth playing. What's next for PC Building Simulator? The developer of PC Building Simulator has some big plans, including a new partnership with a vendor for peripherals. This would enable players to switch out objects like monitors, mice, and keyboards. The catalog of parts and manufacturers will continue to be expanded and we're likely to see more features added to the campaign. PC Building Simulator not only allows you to virtually design and build your own PC that you can rely on to order parts and create it for real, but it also lets you take charge of a PC repair shop and deal with common PC-related issues.